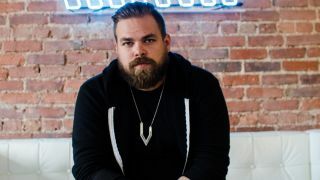 The DJ/producer on how he creates his "mid-fi synth-wave slow motion funk"
Com Truise: "I hated the '80s forever and wanted nothing to do with them. But then my friend said, 'You've got to listen to this stuff and check it out.'" When you look up at the large glowing pentagon that Com Truise stands behind on stage, you realise that it's not too dissimilar to the glowing crystal at the centre of Michael York's palm in the film Logan's Run. It's a fitting image for New Yorker Seth Haley, who's worked under the spoonerism since he began releasing music in 2010. The "mid-fi synth-wave slow motion Funk" he's been churning out has something of an affinity with the 1976 sci-fi epic. Sporting the genuine sound of a world that was sequenced but still hadn't quite reached the MIDI horizon, Haley's work embraces an early '80s aesthetic that went missing once synths began to speak to one another. But, even though a fair number of the Moogfest attendees who have rammed themselves into the Asheville's Orange Peel weren't born when minimal wave ruled the world of film and TV soundtracks and its conjoined twin electro was coursing through the concrete pastures of several US cities, the crowd are loving it. Haley, who doesn't look as if he's even crested the 30 year mark, came to his style of music slowly via drum 'n' bass, the work of Warp artists Boards of Canada, and the suggestions of friends who thought '80s synth pop was worthy of his attention. Now signed to Ghostly International, he tours the world and has been in demand as a remix artist. Two albums and several EPs deep into his career, Haley took a break to talk to us in a posh press room where pour-over coffees and white leather couches were on offer. You got your start on the decks? "About 15 years ago I got started as a DJ before I made the logical progression into production. I originally got into electronic music with The Chemical Brothers, the Prodigy and other big beat stuff. One day I was at my cousin's house listening to one of the digital music channels on his cable system and this artist came up, AK1200, and it was drum 'n' bass and I'd never heard anything like it. I went home and did my research and then bought some mix CDs and started to build a collection. I asked for turntables for Christmas that year and I went from there." Coming out of that Drum 'n' Bass DJ world, what was your first production setup like? "Pretty much a computer and a little MIDI keyboard. I was using FruityLoops and the Hammerhead Rhythm Station. and then I got into Reason around the same time. I've been using Reason ever since. This was around 2000 or 1999 maybe. Pretty silly stuff." "I record everything in Ableton and sequence in Reason. It's kind of a backwards process, but I've just been doing it so long it's comfortable to me." At what point did you start to get excited about the stuff that you were making? "I'm a very much a 'find it on my own' kind of guy, but once I heard that I switched from drum 'n' bass into ambient stuff. I bought my first synthesizer, which was a Minimoog Voyager, in 2003 and it was a very expensive purchase. I was living in upstate New York, outside of Syracuse." What drove you in the direction of the Moog? "At that time I wasn't extremely aware of vintage stuff. And everywhere I would read about Moog, but it was the sound I wanted. So I picked it up and it was tricky to get used to at first. I never had anything like it before, and I used it for a long time. I kind of went for the beat scene for a while after, and started to do hip-hop. Then the ambient stuff and the hip-hop stuff kind of culminated into Com Truise. "Actually I hated the '80s forever and wanted nothing to do with them. But then my friend said, 'You've got to listen to this stuff and check it out.' And one day I did and I couldn't believe I hadn't given it a chance. But I'm kind of glad that I got into it that way because later in life I suddenly had all of this music I hadn't heard before and I could do research and really dive into it. Then I got into [sound] libraries and stuff." Do you get any negative feedback about repping this era of music? "Not so much. It's mostly about the spoonerism regarding the name. I feel like for some reason I came up with a crop of artists that did similar stuff... very heavily '80s influenced. But for some reason I was able to escape them. But I can't think of one time where someone has said it's too '80s." What does your studio arsenal look like now? "It's an insane amount of gear. I had a little studio space in Brooklyn that I moved out of and I've moved everything back into my apartment. I like the bedroom vibe of having everything at home. It was nice having a studio space, but I found that I'd get up and really have to force myself to go there. Now I get up in the morning, make my own coffee, and my own bathroom is there and I can make my own lunch without going out to the deli every time I need something. I just started putting it together recently, though, and have now been getting into this outboard processing stuff. I'm picking up some older pieces of equipment." "I feel like for some reason I came up with a crop of artists that did similar stuff... very heavily '80s influenced. But for some reason I was able to escape them." Does this mean that you're living in the headphones world? "Yeah. It's a funny thing because I hated producing on headphones, but right next to my apartment is a seafood storage of some kind. And there's an air conditioning unit running 24/7 and, even though I just bought these really nice monitors, I'm thinking what's the point of those if you're always going to have this weird noise coming in. So I'm sticking to the headphones these days, which I don't really like, but I think I'm learning from in some ways. I'm really taking into account different levels, especially in the mixing phase. But also it's forced me towards a nice studio in Carroll Gardens in Brooklyn that my buddies run with a beautiful Neve console. So I'm going to start mixing there. So [at home] I've just been doing things real rough." So is the rest of the setup still very computer-based? "I use an iMac and I just picked up a board from the '80s that I'm really into called a Soundtracs... It's one of the FM series... it's an 8-4-2." "I've been trying to hone it down and I've been focusing on the Akai AX80, and I bought a [Roland] Juno-106 a while back, and I also have a [Moog] Slim Phatty. I have the Dave Smith Prophet '08, but my favourite is the Crumar Bit One. Nothing sounds like that goofy thing. It's very temperamental. I bought it from the Tone Tweakers so, when I got it, it looked like it just came out of the factory. It was perfect. I was totally blown away. "And now I'm waiting for the secret weapon, which is a Rhodes Chroma. It's in the shop getting repaired. And I've also been getting into the Eurorack world." What sort of modules are you using? "I have three big cases. I'm a big fan of the Make Noise guys, Intellijel, Harvestman and Busy Circuits... that sort of stuff. But I record everything in Ableton and sequence in Reason. It's kind of a backwards process, but I've just been doing it so long it's comfortable to me. I've used Logic and Cubase and Pro Tools, but I think it gives some quality to the music doing it in Reason. I'm starting to expand a bit, too, and use some of the third-party developers who've made effect units for it. I like that aspect of it." Is there a temptation to bring that outboard gear on the road like Pretty Lights does? "I actually have the Dave Smith Mopho and the Mopho x4 on the road. I wanted to bring the modular stuff. I just bought one of the Make Noise systems, but I'm still trying to figure out how to incorporate it in the right way. "Just the other day I went over to that modular shop in Brooklyn called Control, and I picked up a bunch of new modules to make some droney stuff to use as segues in between sets. But, the way our setup is now, it's kind of constricted with the platform and two keyboards. I'm trying to figure out where to put it because I'm pretty jammed in there with MIDI controllers." Your use of delays and reverbs is particularly impressive. Which ones do you rely on most? "I've always been a fan of the [Roland] Space Echo. I really, really, really like the AMS DMX and the RMX. Those things are beautiful. Sometimes I go to that studio that I mentioned and record things through them. I just picked up the Eventide H3500 Ultra-Harmonizer. That sounds so good. And I've also got an Eventide H9 pedal that I've been using as a delay. So I've been getting into the outboard processing. "I used to use the Soundtoys EchoBoy. That was on everything but, once I picked up the H9 and the H3500, it was like these things have some crazy quality. They can be really finicky, though, when it comes to dialling in the milliseconds, but..."
So, when it comes to an older track like Sundriped that has those nice fluttering parts... is that more about the synth or an effect? "I think that was probably the Arturia Prophet V. The actually brassy sounds were Oberheim Matrix 6." Another track that has a distinct deep vibe to it is Futureworld from the Galactic Melt record. What's going on there? What about Dreambender from the next record [In Decay]? Is that you using live bass? "That's not a sample. I played that myself. I get a lot of people saying, 'You sampled Joy Division!' but I always fire back when I read that. It's the one thing that gets me to engage with people [online]. I played that. I have an Epiphone EB-0. It's not vintage or anything but it's nice. But I think I may pick up a '70s Fender bass soon. I used one in Italy with no effects or anything. I just plugged it into the amp in the studio and thought, 'This is the sound I really want.' I can kind of model the other one but you have to work pretty hard to get there." And with Declination, was that the first time you dealt with a vocal studio-wise? "Yes! That song had actually been finished for a very long time and then, when we were putting the EP together [Wave 1], Ghostly said, 'Why don't you try some vocals out?' and Joel Ford did some good stuff. So I wrote out a couple of paragraphs about what the track means and the whole story and he just worked his magic. "Beforehand he said he had been kind of doing some stuff with weird processing in a Scritti Politti kind of style and I said, 'Great!'. He sent it back and it kind of took me a while to get into it, but when I did I thought it sounded amazing. It came out pretty good for a first real studio vocal. I think we're going [to work] together again when it comes to the next album. We've been sending tracks back and forth to try and come up with something." "But it was weird. I always try to approach remixes by stripping everything. If I can save guitar stems or keyboard stems for the melody [that's fine], but basically I rewrite the whole song. I call it reproducing rather than remixing. Then I just use the vocals. I just started with the melody. I just got the MP3 and started writing on top of it and trying different chord progressions. Then I finally got the stems, chopped the vocals up and put it all together. I think I did that in two days." "I'm a creature of habit, and once in a while I just go to the well and work from the arsenal of presets that I've put together. The delays just become my sound and my thing that way. It's definitely the Space Echo and I was using some of the PSP delays. I think it was the 42." We'd be remiss if we didn't ask about the name. You don't look penniless so I assume you haven't been hit with any sort of a restraining order. Do you think there's an awareness out there of you from him? "It has to have crossed his desk I think at this point. I think one of his sons is a DJ so there's probably electronic music floating around the household and that might be my one saving grace if he says, 'Aw Dad, don't worry about him.' [Laughs]"
Com Truise's most recent release is Wave 1 (Ghostly).